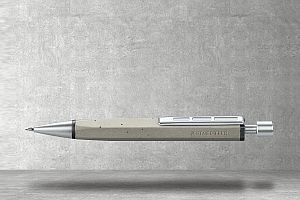 The writing instrument specialist Staedtler has the art of German engineering ready at hand from now on: Staedtler Concrete is namely, according to company accounts, the first writing instrument made out of high-performance concrete – the barrel and the lens at the end of the pusher are cast by hand in Germany. The concrete used for the pens was especially developed and is extremely shatter-proof and lightweight. The bubbles in the concrete that arise during the pouring process turn each model into a unique specimen. In addition to its attractive appearance, the unusual hexagonal shape of the writing instrument that is dispatched individually packed inside a case is very comfortable to hold. The barrel can be laser engraved with logos and names. On request a logo can be cast in concrete. The concrete messenger that was distinguished with a Promotional Gift Award 2018 in the category Premium Products is available as a ballpoint execution and as a mechanical pencil. The writing instrument makes an ideal haptic component with high communicative potential especially for companies that work with concrete – i.e. concrete factories, architects, civil engineers and planning offices – but also the administrators or operators of special buildings such as airports or tunnels.